Rank each of the eight compounds A through H below in order of decreasing acidity (1 = most acidic). Don't get intimidated! What are the differences between these compounds? 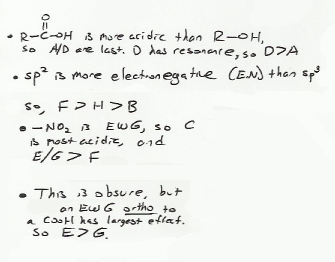 Consider electron withdrawing groups (EWG), resonance, hybridization, and the functional group of the acidic proton. MendelSet practice problem # 717 submitted by Matt on July 23, 2011.